This Aromatherapy Pillar Candle contains the finest botanical essences to fill your favorite room with the sweet smell of Morning Mint! Enjoy the exquisite fragrance and soft glow of this dripless and exceptionally clean-burning candle. 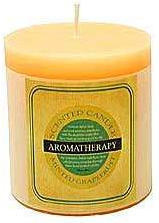 The Aromatherapy Pillar Candle measures 3" in diamater by 3" high. More Photographs - Minted Grapefruit - 3" x 3"
End of More Photographs - Minted Grapefruit - 3" x 3"